Madera County, California (1950 pop. 36,904; 2000 pop. 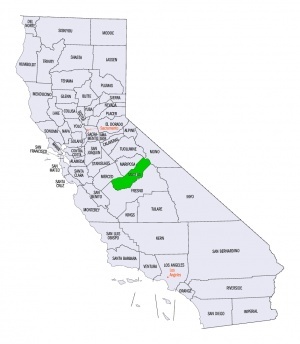 123,109), is located in the central part of the San Joaquin Valley. The county seat and principal city of 14,000 (1953 estimate) carries the county's name and is known as the gateway to Yosemite National Park. The Mennonite population in 1955 of Madera County was made up of approximately 15 families, mostly rural, and almost entirely Mennonite Brethren, with several General Conference Mennonite families who attended the Mennonite Brethren services. The Mennonite Brethren congregation was the only Mennonite institution in the county, having 34 members in 1953. The first Mennonite congregation (General Conference Mennonite) in Madera County was organized in 1914. The Co-operative Land Company built a church for it in the Mennonite community 10 miles northwest of Madera, which was taken over by the Mennonite Brethren in 1919, who finished paying for the church property. During the first few years of settlement, the General Conference group largely moved away because of poor economic conditions. The Mennonites of the 1950s were predominantly cotton and dairy farmers, with some working for wages in the city of Madera. Several families of Mennonite origin attended the Baptist and Assembly of God churches in Madera. Just, L. R. "Madera County (California, USA)." Global Anabaptist Mennonite Encyclopedia Online. 1957. Web. 22 Apr 2019. http://gameo.org/index.php?title=Madera_County_(California,_USA)&oldid=141376. Just, L. R. (1957). Madera County (California, USA). Global Anabaptist Mennonite Encyclopedia Online. Retrieved 22 April 2019, from http://gameo.org/index.php?title=Madera_County_(California,_USA)&oldid=141376. Adapted by permission of Herald Press, Harrisonburg, Virginia, from Mennonite Encyclopedia, Vol. 3, pp. 434-435. All rights reserved. This page was last modified on 28 November 2016, at 03:51.